EXOCET: The Worse Nightmare for the Nigerian Navy. In the 1980s the Nigerian Navy was the largest and best equipped navy in Sub Sahara Africa, outclassing the South African Navy at the time in tonnage and firepower. 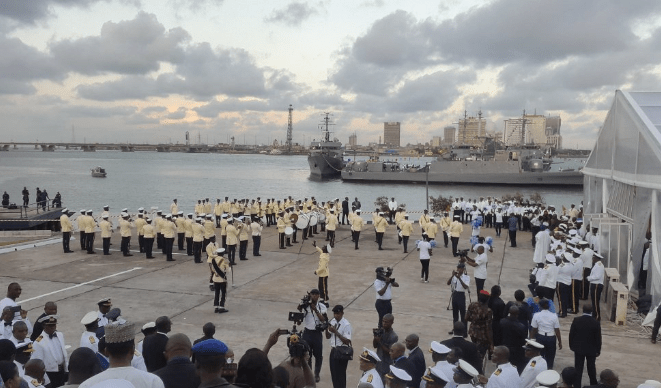 Regionally the combined navies of West Africa could not hope the match the Nigerian Navy in virtually every metrics, personnel, tonnage, firepower and training. The tip of the spear of Nigeria’s naval firepower were its missiles. Italian built Ottomat anti-ship missiles. Aspid missiles. The MEKO-360 – Aradu – frigate, the flagship of the Nigerian Navy until 2012 came with a compliment of 40 Ottomat Mk1 missiles. The Aradu also featured at the time the most advanced anti- aircraft fire control system of any warship in the world. A testament to the efficiency of German technology. 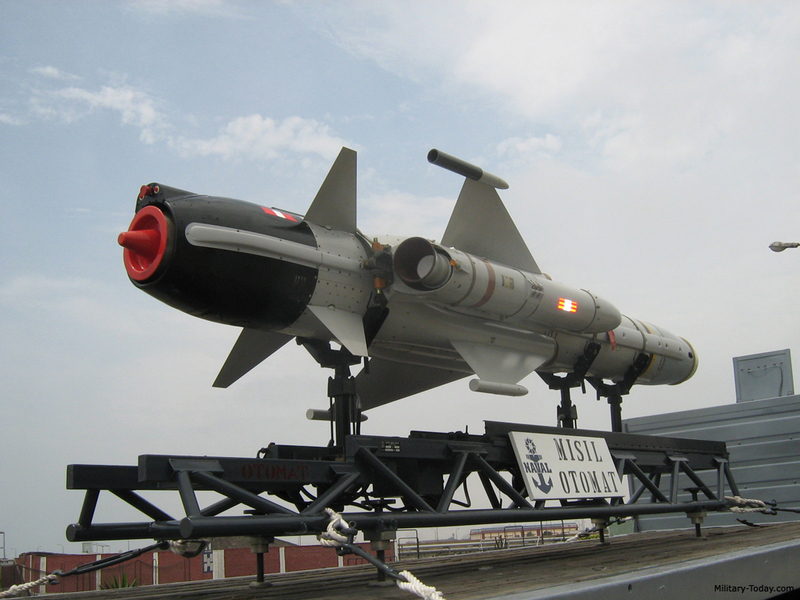 The Ottomat missile was indeed Nigeria’s first and only cruise missile. NNS Aradu could fire 15 Ottomat anti-ship missiles or sea and ground targets. The missile is powered by two solid propellant booster rockets and a turbojet engine giving the missile a range of 60 km. It carries a 210 kg high explosive semi-armor piercing warhead. About 25 Otomat Mk 1 was delivered between 1980/1981 for FPB-57 Type – NNS Ekpe, 15 Ottomat Mk1 missiles for NNS Ayam, and a similar number for NNS Siri. These three 58 metre Combattante III missile Fast Attack Craft were the Nigerian Navies dedicated missile boats. Nigeria’s fleet of missile launching fast attack crafts was intimidating. NNS AYAM and NNS EKPE at the forground during a ceremony at the Nigerian Navy Western Naval Command, papa, Lagos. Coupled with their compliment of Aspid missiles, 76mm Oto Melara deck guns, Twin Breda 40mm guns and two twin Emerlec 30mm AA+ Surface guns, they were the most heavily armed ships in the Nigerian Navy. NNS Siri, NNS Ayam and NNS Ekpe all saw action during the Liberian and Sierra-leonian civil wars. Today it is the Cameroonian Navy, a country a decade behind Nigeria in development and with little resources that warrants protection, that has the capability to deliver offensive firepower 70 miles out from standoff distances without needed to leave port. The Cameroonian Navy ship subtely named CNS Bakassi, as of this writing is equipped with 17 Exocet anti-ship missiles. The important point to note here is that this is relative to the peacetime posture of the Cameroonian Navy. If hostility ensues tomorrow between the Nigerian and Cameroonian Navy that number could swell to as many as 50 depending on how fast France can deliver the missiles so its ally can defend itself. Cameroon can have missiles delivered and operational faster than the Nigerian Navy can begin negotiation for offensive firepower and trying to figure out ways to configure its existing fleet to carry anti-ship missiles. By the time the navy is ready the war would have been over. Amassing large number of ships will not compensate for this deficiency. Whats worse, the MM38, MM40 model of Exocet anti-ship missiles on the P-48s CNS Bakassi craft, though old, can be carried by Cameroons Alpha jet. Nigeria has nothing close to this kind of offensive firepower in its entire arsenal. In 2014 the Chinese offer to arm the Type 056 P18N Offshore Patrol Vessel with Chinese made YJ-83 anti-ship and air-defence missiles was not taken up by the Nigerian Navy. 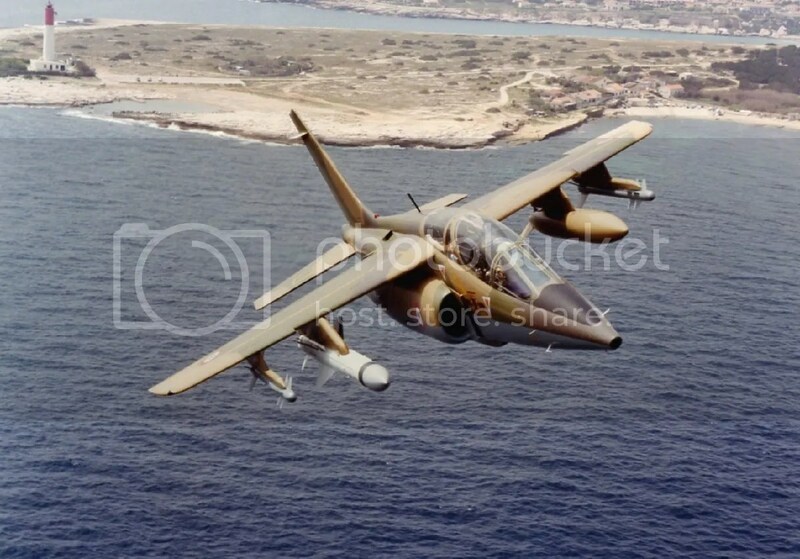 An Alpha Jet with one Exocet anti-ship missile on its weapons hardpoint. Now Nigeria vs Cameroon at sea is not really that much of a contest because of the sheer size and tonnage of the Nigerian Navy. The vast majority of Cameroonian naval vessels is outdated compared to Nigeria’s far more modern fleet, and stats are based on numbers alone. Nigeria also has near infinite resources and manpower and more total equipment which makes it not only qualitatively but quantitatively better. But in a naval shootout Nigeria’s much larger and formidable navy can be stalled and many ships destroyed. The bulk of Cameroons surface fleet are French supplied. 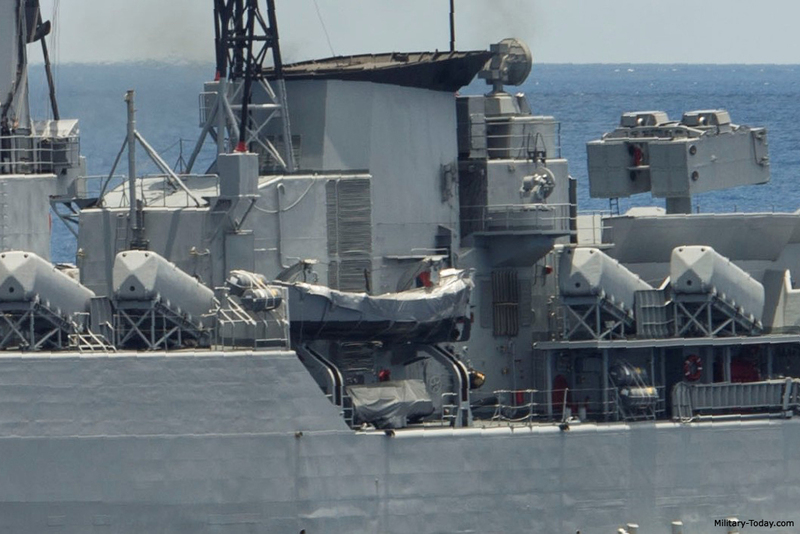 Its navy is French trained their weapons platforms are French designed. This compactness allows almost every ship to carry at least a few Exocet or other French supplied missiles without making hard choices between being a small patrol craft or an offshore patrol craft or corvete. In the event of French intervention, the Nigerian Navy will find its fleet at the bottom of the Atlantic, as was the case in the Iran Iraq civil war. In 1987 the American guided missile frigate USS Samuel B. Roberts struck a mine while deployed in the Persian Gulf as part of Operation Earnest Will, the 1987–88 convoy missions in which U.S. warships escorted reflagged Kuwaiti oil tankers to protect them from Iranian attacks. The explosion blew a 4.5 m (15-foot) hole in the Samuel B. Roberts‘s hull and nearly sank it. The crew saved their ship with no loss of life, and the Samuel B. Roberts was towed to Dubai on 16 April. America’s reaction was swift. 1987 was an era the U.S military did not worry about public opinion before taking action. On 18 April, the U.S. Navy attacked with several groups of surface warships. By the end of the day U.S. air and surface units had sunk, or severely damaged, half of Iran’s operational fleet. American aircraft also destroyed Iranian naval and intelligence facilities on two inoperable oil platforms in the Persian Gulf. All this over a mine. A similar scenario will likely be at play in the Gulf og Guniea or Bakassi waterways in the event of a shoot out between both countries. With no offensive and defensive firepower there is nothing to deter a potential aggressor if the target of opportunity presents itself. 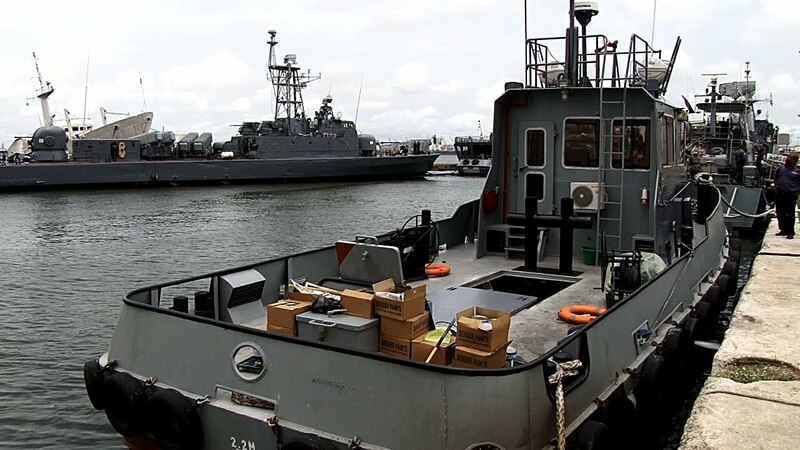 The Nigerian Navy’s bias towards 79mm deck guns and 30mm cannons that can be built and carried in by coastal patrol craft, over anti-ship and anti-air missiles defies understanding and logic. It is only until something really bad and embarrassing happens that those at the helm of affairs began to realise the Nigerian Navys firepower does not look quite “good enough”. A forward thinking nation will consistently seek to preempt the effort of a potential foe by reacting in good time and acquiring systems to counter that of its major rival, thus maintaining the strategic balance of power in its favour. Yet for reasons that defy comprehension there is a definite tendency at least within the past 10 years to be extremely forgiving, sympathetic, turn a blind eye to blatant aggressions against the Nigerian state and optimistic to the aggressive behaviors of its neighbors – in a way other regional powers like Egypt, South Africa or even other Anglophone allies don’t get. From from opening its dams with too little warning, thereby flooding parts of Nigeria, destroying hundreds of villages and rendering nearly a million people homeless, to encroaching on Nigerian territory, razing whole villages to the ground and killing hundreds of Nigerians, to Oppresing Nigerian Bakassi villagers, imposing illegal taxes on them and killing those that refuse to comply, to kidnapping Ambazonian Secessionist leader on Nigerian soil in Abuja, taking him back to Cameroon and toturing him, Cameroon decides to take all that generosity and insist it is still the shafted party at the mercy of the giant bully Nigeria. The French made Exocet has a 500-pounder warhead, is powered by 600-pound thrust turbojets, and have ranges from 70 to 100 miles. When Nigeria first fielded the huge Ottomat Mk1 over three decades ago, it was virtually the largest, fastest, longest ranged antishipping missile around, with the biggest warhead. The Exocets relatively compact missile is designed for attacking small- to medium-size warships (e.g., frigates, corvettes and destroyers), It is guided inertially in mid-ﬂight and turns on active radar late in its ﬂight to ﬁnd and hit its target. As a counter-measure against the airdefence around the target,it main-tains a very low altitude during ingress, staying 1–2 mabove the sea surface. Due to the eﬀect of the radar horizon, this means that the target may not detect an incoming attack until the missile is only 6,000 m from impact. This leaves little time for reaction, as the British found out the hard way when a much inferior Argentine airforce sank a British Destroyer during the Falksland war with an Exocet missiles. Killing dozens. Nigeria has no equivalent to this day. No anti-ship missile, no air defense missiles, no torpedoes, no Close in Weapons Systems (CWIZ) In a hypothetical scenario no Nigerian warship will survive the first 24 hours in a contested sealane against a well armed navy. The advent of anti-ship missiles means size is no longer the determining factor for success. It will be in Nigeria’s best interest to bring all of its missile armed ships rusting away at the docks, or start aquiring offensive and defensive systems on its surface fleet to protect the young sailors onboard and deliver ordnance against miles out. There are very few navies in Africa that compare to the scale and power of the Nigerian Navy. The Nigerian navy is designed around long extensive patrols and quick interdiction. Granted the Nigerian navy is a Littoral Patrol Force, and most of the situations it is going to be in revolve around that, Stoping pirates, protecting offshore oil platforms along Nigeria’s EEZ, mostly in the Gulf of Guinea etc. It’s not built to sink enemy warships or find and sink submarines. However, small nations with impressive missile capabilities like the Cameroonian Navy have them because they were and are still preparing to deal with Nigeria, which they will always consider a dangerous behemoth by virtue of its size. No amount of appeasement will ever change that. Relying on the goodwill of potential aggressors and refusing to prepare for any eventuality is the fastest path to destruction. The Cameroonians know that they would be up against the long arm of a navy whose surface fleet outnumber theirs by a factor of nearly 10 to one, and had to acquire capabilities that will compensate for its deficiency by being able to launch projectiles from outside the range of any Nigerian vessel and coastal defences. Weapons like the EXOCET anti-ship missiles are based on the tactics and situations that they are likely going to be involved in. So they developed tactics and their arsenal to fit those parameters. Nigeria historically has less need for long-range anti-ship missiles because there is no comparable navy. While countries like Cameroon need ways to hit Nigeria’s massive fleet. Previous Post Previous post:Watch: Nigerian Air Force Mi-35 Helicopter and Alpha Jet Destroy Armed Bandits Camp in Zamfara. Next Post Spotlighting Nigeria’s ISR Architecture.